One of a group of organic compounds based on the general formula Cx(H2O)y. The simplest carbohydrates are the *sugars (saccharides), including glucose and sucrose. *Polysaccharides are carbohydrates of much greater molecular weight and complexity; examples are starch, glycogen, and cellulose. Carbohydrates perform many vital roles in living organisms. Sugars, notably glucose, and their derivatives are essential intermediates in the conversion of food to energy. Starch and other polysaccharides serve as energy stores in plants, particularly in seeds, tubers, etc., which provide a major energy source for animals, including humans. Cellulose, lignin, and others form the supporting cell walls and woody tissue of plants. Chitin is a structural polysaccharide found in the body shells of many invertebrate animals. Carbohydrates also occur in the surface coat of animal cells and in bacterial cell walls. Any of a group of water-soluble *carbohydrates of relatively low molecular weight and typically having a sweet taste. The simple sugars are called *monosaccharides. 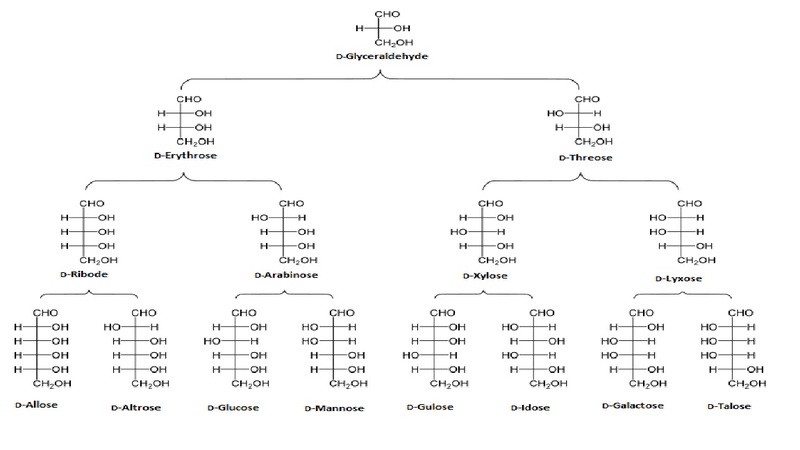 More complex sugars comprise between two and ten monosaccharides linked together: *disaccharides contain two, trisaccharides three, and so on. The name is often used to refer specifically to *sucrose (cane or beet sugar). "Decyl-glucoside-2D-skeletal". Licensed under Public Domain via Commons.